As is the conundrum of time, the start of the Knights Templar was before their beginning. The victorious First Crusade (1096-1099) opened the Holy Land to Christian pilgrims. However, in spite of the crusaders’ triumph and the capture of Jerusalem (15th July 1099), there was no real security for these religious journeymen. Between local brigands and crusaders, with less than Christian ambitions, pilgrims were often robbed or ended their travels much closer to God than they intended. The dangers faced by the pilgrims were recognised by Hughes de Payns and Geoffroy de Saint-Omer. (The former belonged to the household of the Count of Champagne, the latter lived under the canon rule of Saint-Augustin.) Together they chose to guard the most dangerous access way to Jerusalem: the Athlit Pass. The pass later became known as 'Chateau Pelerin'. On their return to the Holy City, in 1118, Baldwin II, King of Jerusalem, granted them a part of his Palace as reward for their deeds and devotion. The part granted was within the Temple of Salomon. Their residence there bestowed the name and symbolised the beginning of the Knights Templar. The French Knights Andre de Monbard (nephew of St Bernard), Gondemare, Godefroy, Roral, Payen de Montdesir, Geoffroy Bisol and Archambaud de Saint-Agnan shared the vision of protecting pilgrims. So with auspicious quarters and impressive credentials the original 2 Knights were joined by 7 others. By 1119 the Order of the Knights Templar was a force in the making. The next nine years did not realise much growth. This hiatus draws much speculation, and while conspiracy theories abound, our story continues on 14th January 1128. Troyes was the capital city of Champagne, heartland of the Cistercian Order and home of Hughes de Payns. It was also the location for the Council of Troyes. The Council of Troyes was convened by Pope Honorius II to settle certain disputes of the bishops of Paris and regulate other matters of the Church of France. The Council was presided over by Cardinal Matthew and the Bishop of Albano. They appointed Bernard of Clairvaux secretary of the council and charged him with drawing up the synod statutes. Bernard may have had an agenda of his own though. Bernard had converted Rules of St Benedict for his foundation of the Cistercians themselves. With little work, the same conversion would befit the Knights Templar. The first Templars were given a copy of Rules of St Augustine used by the monks of the Abbey of St Victor. They received this upon their creation in Jerusalem, just as their predecessors had received Rules, when Godefred de Bouillon created the Order of the Canons of the Holy Sepulchre. When Hugues de Payns went to the Council of Troyes, he brought a copy of Rules of St Augustine with him. He read the articles of Rules to the participants who discussed which articles were appropriate and which were not. Of course St Bernard participated in these discussions. So the Council of Troyes delivered Rules and official sanction. The Order of the Knights Templar was born. Indeed, it some suggest that the Order was fathered by the politics of Bernard of Clairvaux (St Bernard). Further testimony as to the pivotal role St Bernard played in the birth of the Templars is evidenced in his letter ‘In Praise of the New Knighthood’. This letter was written by St Bernard in response to a request by Hugues de Payns a few years after the Council of Troyes (between 1132 and 1136). At that time the Order was becoming famous and was heavily recruiting, as suggested by St Bernard's words: "These events at Jerusalem have shaken the world. The islands hearken, and the people from afar give ear. They swarm forth from East and West, as a flood stream bringing glory to the nations and a rushing river gladdening the city of God. What could be more profitable and pleasant to behold than seeing such a multitude coming to reinforce the few?" With St Bernard as patron recruiting success was a mere formality. Success can be mythologised, as can its appearance. So the visage of the Knights Templar is often inaccurately portrayed. It was not until 1147 that the Pope Eugene III granted the Templars the right to wear a red cross. Before this time the knights wore only a white coat and their sergeants wore a brown one. While numerous drawings and pictures show the cross affixed in various places it was actually sewn above the heart on the left side of the Templar garment. In addition to the misleading representation of the cross, each period adapted the Templar image to its own style. By example, in the XVIIth century Jacques de Molay was depicted wearing a hat trimmed with a feather. Perhaps acceptable for a Musketeer, but a complete anachronism for the Crusades period. Over more than a century and a half, the Templars grew their power and their aura. In 1291 though, St Jean d'Acre fell and the Templars returned to the West. With no more mission to protect the pilgrims a lot of rifts developed. For some historians, the fall of Ascalon in August 1153 is an example of the ambitions to temporal power of some Masters of the Order. In 1153 Baldwin III, King of Jerusalem, decided to lay siege to the Turkish stronghold of Ascalon. The Templars and the Hospitallers accompanied the King's army. 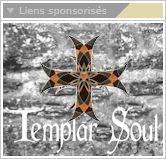 When a breach was made in the city wall Templar Grand Master Bernard de Tremelay and his soldiers blocked it and did not allow the Hospitallers to enter. The block was supposed to allow the Templar Knights a free rein in the city. Instead it allowed the Turks to counter attack and all the Templars including their Master were killed. The struggle between the Templars and the Hospitallers is well documented. It often caused strain in the Crusader camps and caused a negative impact on the cohesion of the Francs in the Holy Land. The return of the Templars to the West did not please everybody. In particular, without the financial ravages of the holly war, the Order grew richer with every passing day. Donations, purchases, interest on loans... The accumulation of power seemed to throw French Feudalism into a state of confusion. Philip IV was envious of the Templar’s wealth and power. At first he tried to use the Knights for his own aims. Philip even harboured delusions of becoming Grand Master of the Order while staying King of France. It is open to debate which position would wield the most power. After all the Templars were Bankers to European nobility. They counted Henry III of England, Louis IX and Philip August amongst their clientele. Philip IV was also in their debt. He not only owed them money but, as they protected him during the Paris riots, it can be argued that Philip even owed them his life. With little hope of defeating the Templars by legal means, Philip the Fair eventually resigned to more ignoble methods. He ordered that in the early hours of Friday the 13th of October 1307 all Templars in the kingdom of France were to be arrested. Following the arrests an inquisition trial was held. For the next seven years, while their brothers were imprisoned and tortured, free Templars searched for ways to justify themselves to the Pope. In theory, he was the only person to whom they answered. Unfortunately for the Templars the Pope was also at the mercy of Philip IV. So on March 22 1312 Pope Clement V issued ‘Vox in Excelso’ as his Papal Bull to suppress the Knights Templar. As a result of the conspiracy between Philip IV and Clement V on March 11th 1314 Jacques de Molay and Geoffroy de Charnay were sentenced to burn at the stake. The site was on the 'Ile de la Cité' in Paris, within view of the Royal Palace. Pope Clement V died on April 20th and Philip IV on November 29th. Following the demise of Philip IV, the kings of France were called 'the damned kings'. The curse of Jacques de Molay hanging over the lineage until the death of Louis XVI (22nd successor of Philip the Fair). Whether historical irony or apt symbolism, Louis XVI was imprisoned in Paris in the dungeon once used by Templars at their chieftain house. Since the last Grand Master there have been many movements claiming the Templar inheritance. Indeed the subject is a magnet for scholars and charlatans alike. Templar treasure, Templar esotericism, Templar power, Hidden rule... despite the appeal of audacious assertions, perhaps the myth is more important than the truth.